Example sentance: I went to pick up my quilt from the show but the Quitches elbowed me in the ribs, pushed in front of me and sneered at it because of the modern use of colour. 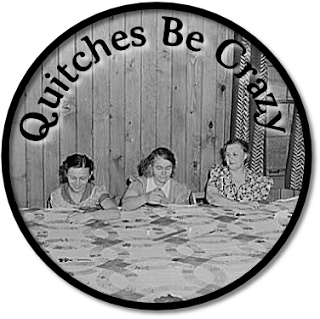 Quitches Be Crazy is a new feature which I am sharing with my dear friend Rats as Big as Cats. We're not like the other Quitches and are enjoying some learning about and inspiring each other whilst living far apart nowadays. We are in fact having a frenaissance, (yes it's a Friends' reference), where we get to know each other better again, after big changes in each of our lives. We are also encouraging one-another to blog-up too. Since we are thoroughly modern ladies we are going multimedia with this thing a mix of photos, words, links, and sounds to answer questions each week. If you want to play too we've got a button. We will pick our questions by Wednesday and post on a Monday. To go full linky do post in the comments here. It's a first for us and we're keen to learn from it. So feedback to me is very welcome. You can email me (nearlybutnotquite [at] rocketmail [dot] com, comment here or find me on twitter (as nbnqnbnq). of course! From next week we will be tweeting the questions on a Wednesday. answer as many as you feel inspired by and add a link to our posts! As soon as we figure out all the wizardry there will be buttons for all to add to your posts.